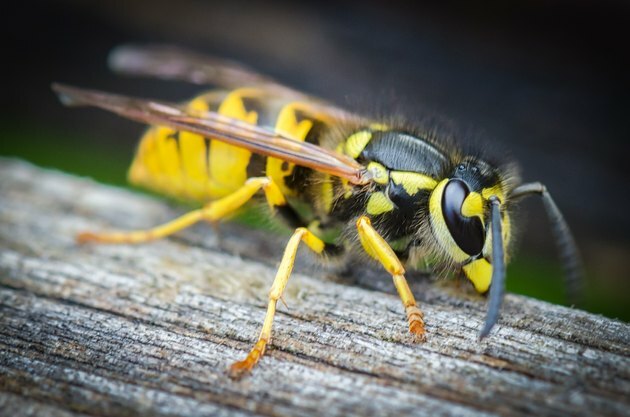 You've heard of queen bees and the Queens of England, but what about a queen wasp or a queen hornet? These insects have queens as well, and a wasp "queen bee" is just as important to wasp nests as queens are to beehives. They are equally well guarded and elusive however, and you are not likely to identify one by its physical characteristics. Queen bees have one job only: to lay eggs. The queen bee is the only female bee in a beehive to lay eggs, so her health and welfare are essential to the entire colony. The jobs of most of the rest of the bees revolve around meeting the needs of the queen bee and the eggs. The term "queen bee" is used to refer to a critically central female of any species, including humans. A wasp queen has the same important job as a queen bee. No other wasps in the colony can lay eggs. That's why all of the worker wasps toil away to get the queen what she needs and to take care of the eggs. They feed and care for her, then die off in winter. The queen wasp, carrying fertilized eggs, overwinters somewhere warm and dry. She emerges in spring to begin the wasp colony again. No matter how much you read about the physical characteristics of a queen wasp or hornet, you are not likely to be able to pick one out of a line-up. If you look at queen wasp pictures, you'll find that the queen is sometimes a little longer than worker wasps, perhaps a quarter inch. And in some varieties of wasps, queens have a pointed lower abdomen and narrow waist that the non-royal members of the colony do not have. However, these wasp-queen/workers differences are not universal, applying only to some species and some queens. That means that identifying a wasp by the wasp queen size is not something you are likely to be able to accomplish. Paper wasp queen identification is not possible by size, since all paper wasps look alike from birth. The information that allows you to identify a queen wasp has nothing to do with looks. Instead, it's the fact that the queen is generally the only wasp to survive the winter. She is the only wasp to leave the nest as cool winter weather rolls in. The remainder of the wasps die, but the queen finds a place to overwinter. If she doesn't succeed, the wasp colony is history. Wasp queens need warm, dry, protected areas to spend the winter. Generally, they look for protection from temperatures, humidity and predators. The hiding place might be a crevice in the walls of a building, but it can also be inside a rotting tree trunk. If you spot one solo wasp in winter, it is likely the queen wasp.